This new report from the Pew survey doesn’t seem to mesh well with other surveys of College students. For example, the UCLA Higher Education Research Institute says that 2/3 of new frosh in 2010 were making education decisions based on economics, and 56.5% of frosh in 2009 were going to college because “graduates get good jobs.” Janet Donald has reported studies saying that the percentage of students who are going to college purely to get a new job is over 70% today. 47% of students aiming just for a job (not also an education) in the Pew study feels low to me. Perhaps it’s because assessing the value of a college education is not a hard-and-fast calculation. Sure, diplomas help Americans land better jobs and earn higher salaries, and one can estimate the financial return on those investments. Yet the perceived benefits of attending college go well beyond dollars. These findings echo the words graduates often use to describe the benefits of their college experi­ences. Typically, those benefits are intangible, immeasurable, and untethered to narrow questions about what a particular degree “got” them. via It’s More Than Just the Degree, Graduates Say – Surveys of the Public and Presidents – The Chronicle of Higher Education. 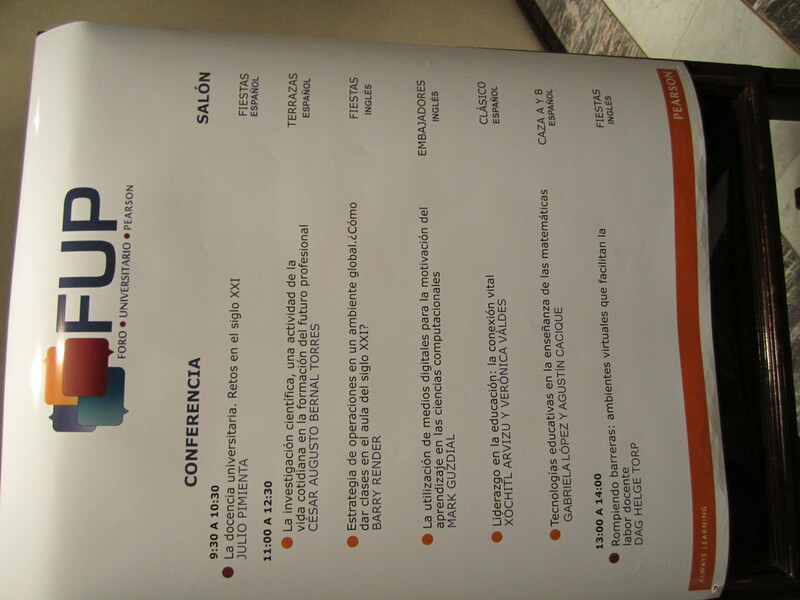 I attended a Pearson sponsored event last week in Mexico City for university faculty. The subject matter range was pretty large, with speakers from Education to Operations Research to Mathematics, and to Computer Science. I was particularly interested by the talk from Julio Pimienta, a Cuban Education scholar now at UNAM. I heard the talk through simultaneous translation, which was an interesting experience especially when the translation was in contrast with the slides I saw before me. I spent a good bit of time with Google Translator to understand the slides separately from the translation. He spent a long time on this one slide. Pimienta asked the audience how they felt about the new national requirements to focus on content standards, and there was a mixed response, which he interpreted as, “Everyone wants students to learn the content, but we’re not convinced that you get there by starting from the content.” He then put up this slide. He said that our traditional educational model is that students learn the content (“contenidos”) which is organized and presented by the teacher (“transformar,” which the translator sometimes translated as “organized” and other times as “presented”), for the students to learn (“aprendizaje”) in such a way that they can use it in new contexts (“contexto”). The problem is that students don’t learn to apply the knowledge in new contexts in this flow. He says that we now focus on reversing that flow. We provide students with interesting and motivating problem contexts, which encourage them to learn, and they have to organize the content that they learn in order to solve the problems. I’ve heard variations on this story before — it’s like Ann Brown‘s argument, and the arguments for Learning by Design and for constructionism. What’s new for me was seeing this as a “reverse flow,” that we want the same content to be learned, but through a context-driven mechanism. Brian Dorn’s dissertation suggests that this doesn’t really work, but might. It’s hard to imagine a better context than real professionals who discover that they need computer science knowledge, and try to teach themselves with on-line materials. Unfortunately, he found that they only get part way there, and inefficiently. Brian shows that, by creating case materials appropriately, we can improve the efficiency and get more significant learning. He got his students to reverse the flow. I’ve always thought about Brian’s work as mostly speaking to the non-traditional learner, the professional learning CS in-the-wild. But now I’m realizing that his work also speaks to how to make problem/project-based learning work. How do we make the content available and organizable by the students? The answer can’t be just lots of recorded lectures and other educational videos — that content is available to Brian’s subjects, too, but it’s not really helping. Here’s an interesting research problem: How do we provide learning resources such that students can find the content that matches their context, and figure out how to organize and apply it? Can we do it in such a way that is useful to a wide range of learners? Wikipedia and MIT Open Courseware aren’t there yet. I do agree with Pimienta that the reverse flow is more likely to lead to deep, transferable learning. I think we’re good at providing contexts. I think we need to work harder at getting to the student-organized content. Money isn’t enough to improve schools. That’s probably obvious, though it’s interesting to see that somebody did the work to provide evidence. When I see what other countries do to improve their education quality, I realize how much of the education picture has to do with culture and respect, and money doesn’t help with that. In the first-of-its-kind analysis of the billionaires’ efforts, NEWSWEEK and the Center for Public Integrity crunched the numbers on graduation rates and test scores in 10 major urban districts—from New York City to Oakland—which got windfalls from these four top philanthropists. via Back to School for the Billionaires – Newsweek. This really speaks to the discussion we were having the other day when talking about traditional lectures vs. interaction, and in particular, open learning resources — just how valuable are the Khan Academy videos for learning? This video explains that it’s about highlighting the misconceptions that really helps with learning, which is something that you get with approaches like peer instruction. This approach is hard to use in computer science education, because we know so little about misconceptions and prior conceptions of computing. It is a common view that “if only someone could break this down and explain it clearly enough, more students would understand.” Khan Academy is a great example of this approach with its clear, concise videos on science. However it is debatable whether they really work. Research has shown that these types of videos may be positively received by students. They feel like they are learning and become more confident in their answers, but tests reveal they haven’t learned anything. The apparent reason for the discrepancy is misconceptions. Students have existing ideas about scientific phenomena before viewing a video. If the video presents scientific concepts in a clear, well illustrated way, students believe they are learning but they do not engage with the media on a deep enough level to realize that what was is presented differs from their prior knowledge. There is hope, however. Presenting students’ common misconceptions in a video alongside the scientific concepts has been shown to increase learning by increasing the amount of mental effort students expend while watching it. via YouTube – Khan Academy and the Effectiveness of Science Videos. A new report says that the greatest potential for growing higher-education is in the bottom half of the US economy. 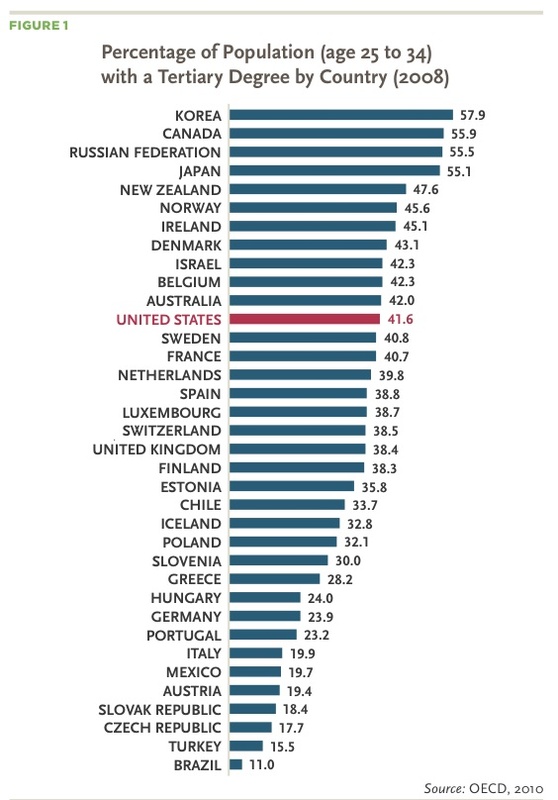 I found the below graph from the report pretty startling — I had heard that the US already had a very high percentage of higher-education degrees among its citizens, but this graph suggests that we’ve got quite a long way to go. President Obama has set a goal for the United States to have the highest proportion of college graduates in the world by 2020. If all Americans attained bachelor’s degree by age 24 at the same rate as do individuals from the top half of the income distribution, the United States would now have the highest share of bachelor’s degree recipients in the world, the report says. via To Raise Educational Levels, Focus on Income-Based Inequality, Report Urges – Students – The Chronicle of Higher Education. This is an older (year old) NYTimes piece, but wow, what a cool one! Really interesting insights into study skills and misconceptions about how studying works. My favorite part, though, is addressing one of the most prevalent claims I hear: That there are “learning styles.” There aren’t. They don’t measurably exist. via Research Upends Traditional Thinking on Study Habits – NYTimes.com. Losing women mid-career is a huge issue in computer science, as NCWIT and the Anita Borg Institute have been reporting. It’s not all an issue of family, though. But maybe it’s not the babies. A study of more than 3,700 female engineers carried out by Nadya Fouad and Romila Singh at the University of Wisconsin–Milwaukee revealed that only a quarter left engineering because of family reasons (http://bit.ly/gA79xQ). The remaining three-quarters quit their jobs or left the field entirely because they did not like the workplace culture, or were unhappy with other aspects of the job. While blatant gender discrimination in the workplace is rare, the subtle, everyday instances of bias that women experience create a snowball effect that, over time, can be overwhelmingly off-putting. More than half of female scientists have experienced gender bias, according to a 2010 survey by the American Association for the Advancement of Science for L’Oréal. Examples include being ignored in meetings, students calling you Mrs. instead of Dr. or Professor, receiving unwanted comments on your appearance, and hearing that you were hired not on merit, but because you’re a woman. via Where are all the women scientists? – 26 April 2011 – New Scientist.